This Passion Play is not being performed in 2017. Please check back for information about future performances. 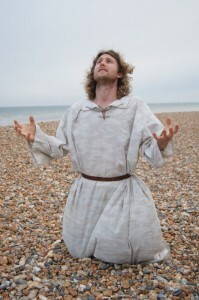 The Shoreham Passion Play was written in mixed dialogue and presentation in an attempt to create a sense of both present time and past time connecting. 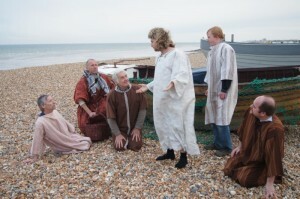 The first part which we call ‘BEGINNINGS” is staged around the Church of the Good Shepherd and the beach on Friday evening. The story is the Bible story brought into todays world with the use of drama and music. We will attempt to involve the audience in this story so that they feel they are there as in the first part at the Wedding and later in the feeding of the 5’000 which will involve bread shared with everyone around. If you are not familiar with the story, a good Gospel to read is Mark as that of all the gospels tells it the most directly. If you get it in a modern version like ‘The Message’ or ‘The Good News’ you will see its dramatic potential!